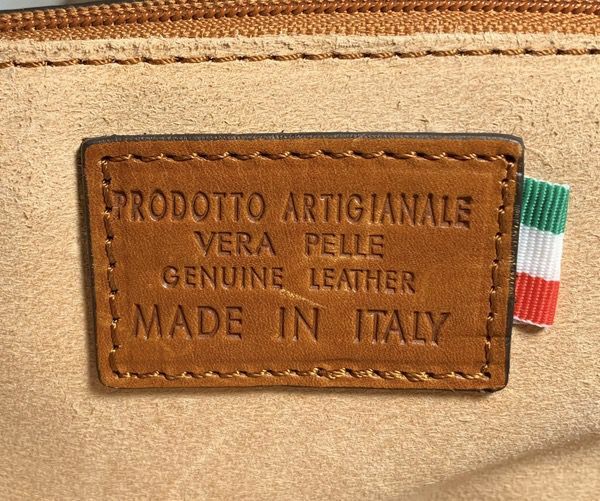 REVIEW – Sweet, sweet Italian craftsmanship. 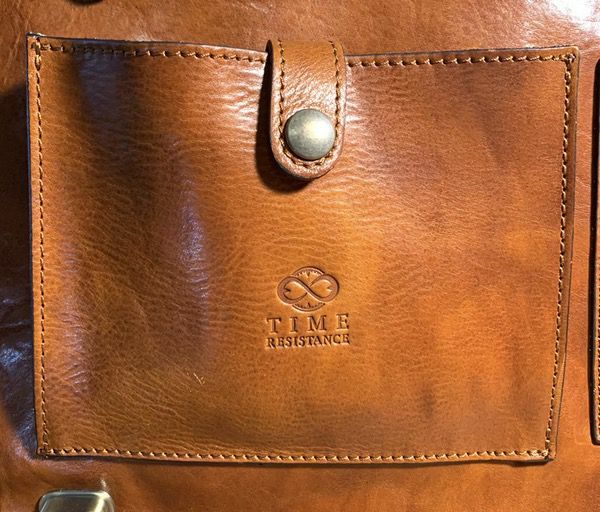 That’s what you’re getting with the Baltic Domini Men’s Orange Leather Briefcase. It’s a beauty, my friends, made for dominating the board room. Grab your best business suit, ‘cause we’re about to get fancy. To the review! 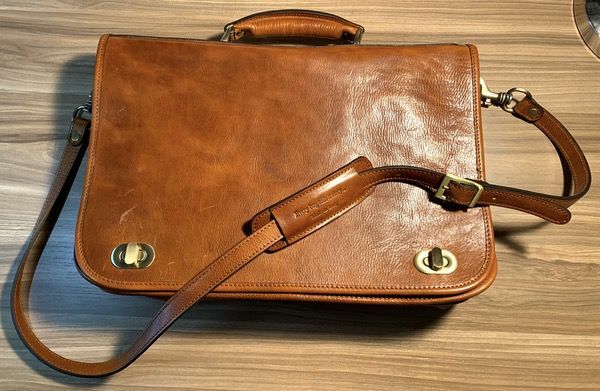 It’s a double gusset (or two compartment) Italian leather briefcase that includes a shoulder strap. The form factor of the Baltic Domini is a classic two gusset briefcase with a flap closure. The design is all business, focused on carrying your office essentials while looking good on the job. Let’s walk through the details! Ain’t it a beauty? I’m getting a 2 mm thickness on the caliper, which puts it at about 5 oz leather… a good thickness for durability, while still maintaining that supple flexibility. It feels amazing when you handle it. Here’s a shot of the suede backside on the main flap. The internal components use an untreated leather that you’ll see in the other pics. Here’s a different angle. See those little brass clips next to my finger? 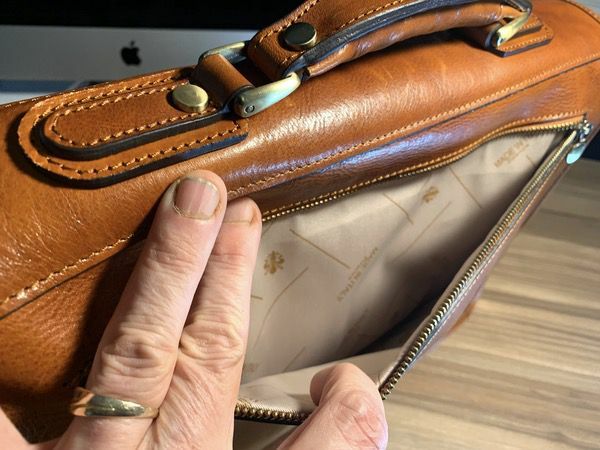 Not only do those finish the edging in a classy way, but they provide “bumpers” that absorb scrapes and bumps as you put stuff in your bag, protecting the seams. Simple, but effective. Here’s a closeup of the carry handle. Note the multiple layers of leather and brass pegs to back up the hardware. I don’t see this as a potential fail point, either. 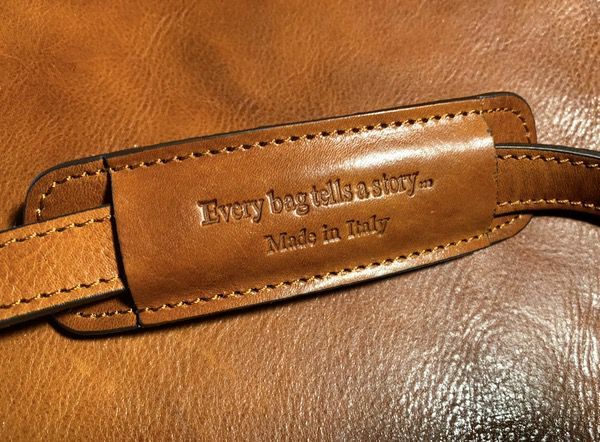 Baltic Domini proudly sports the “Made In Italy” tag in multiple places on the bag including the strap pad, zipper pulls, pocket linings, and this cool tag on the inside of the bag. It’s a bit excessive with all those reminders, but it is subtle enough that it doesn’t detract from the bag’s overall look. And I respect the pride in their heritage. The Baltic Domini Orange Leather Briefcase is built for the office. The lean profile is made for carrying the thin square stuff like your laptop and documents, with multiple pockets for the essential accessories. 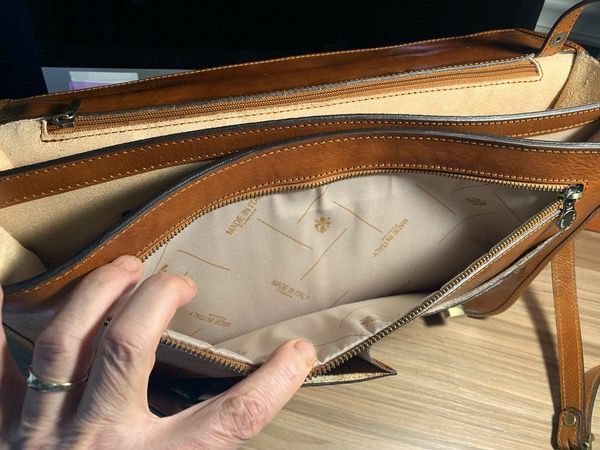 Starting on the exterior, you’ll find a cotton-lined external pocket on the back face of the bag that’s 7″ by 12″. You can *just* get a standard iPad tablet in there, but I think this pocket is better suited for smaller tablets, a notebook, or travel documents. I can’t figure out who makes the zipper, but it feels substantial and features a nice chunky zipper pull. Open up the main flap, and the front face features three pockets for small items. The zip pocket mirrors the one on the exterior, and works for a small notebook or assorted small items. It’s got a nice rugged zipper and zipper pull that match the setup on the exterior pocket. 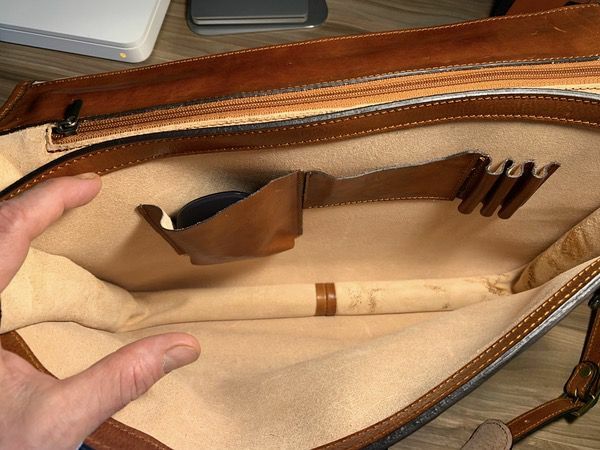 The left pocket is 6″ by 5″ with a button snap closure, and bellows a bit. It’s not quite deep enough for a MacBook power brick, but will happily accept accessories like your USB accessories and a wireless mouse. 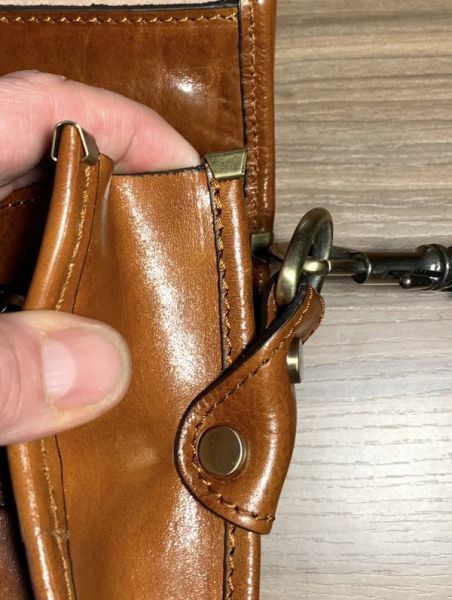 The right pocket is 5″ by 5″ and doesn’t expand. 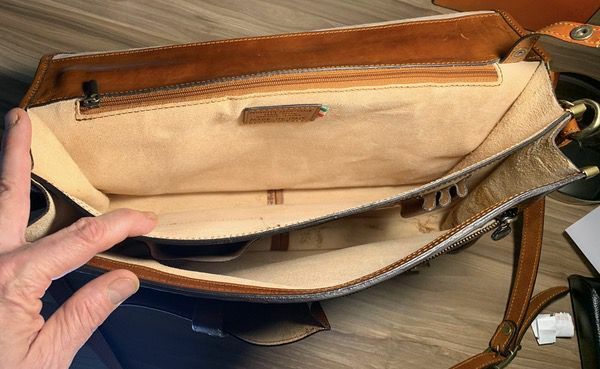 You could drop a standard-sized smartphone in here, but my iPhone XS Max won’t fit comfortable fit in that slot. 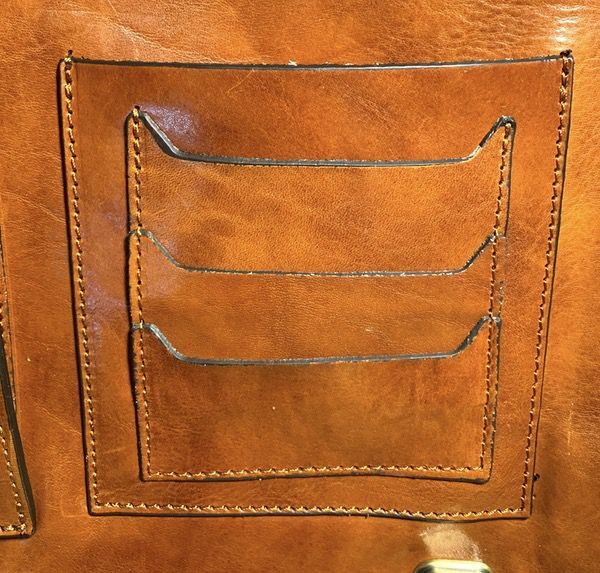 Three business card slots are attached to the front of the pocket. You’ll find another 7″ by 12″ zip pocket on the rear face of this compartment that matches the other zip pockets. The zipper is a little less substantial than the others, but that’s OK given that it’s deep in the bag. 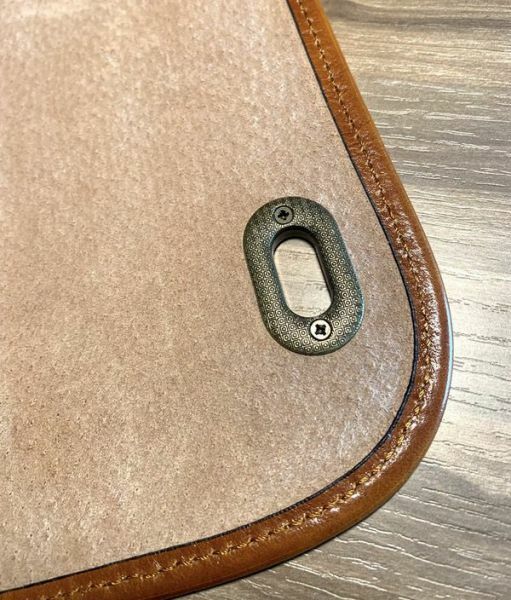 Finally, we have a button-snap leather loop on the back side of the compartment. This is ideal for hanging your keys, or you could use it as an attachment point for other items. I should note that this setup could have your keys scratching up against your laptop if you’ve got a bigger device in there. I don’t have this issue with my 13″ MacBook, but I would have preferred if this loop was attached in the front compartment. For the businessperson looking to add a whole heap of style to your daily carry, the Baltic Domini Orange Leather Briefcase is a treat. It looks amazing and the leather is fantastic. 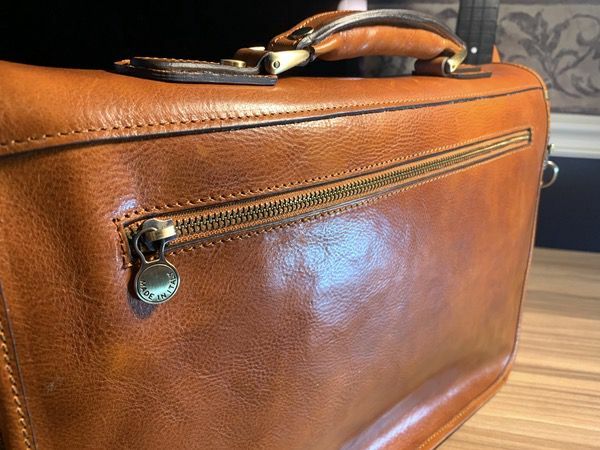 While it maintains a classic look, there are plenty of pockets for accessories and tech that you typically don’t find in traditional briefcases. At a total weight of 3.5 pounds, it also won’t crush your shoulder when you’re loaded up with your work gear. It works equally well if you carry it by the handle or over the shoulder, and the generous drop length on the shoulder strap also allows for messenger-style carry if you’re on the run. 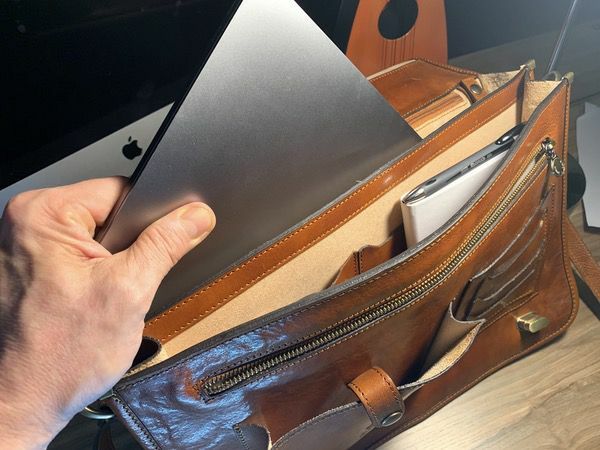 As with most traditional briefcases, the slim, double-gusset form factor does have pros and cons. 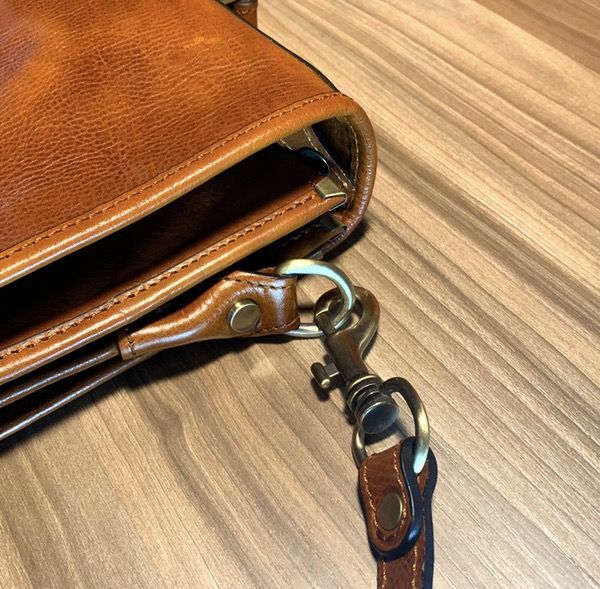 While the leather does give you some flexibility, chunkier items simply won’t fit in the bag and allow for proper closure of the front flap. You won’t be able to stash a standard travel mug or hydration bottle in there, for example. On the flip side, you can load up your documents, folders, and notebooks without fear of the dreaded crushed corners. For smaller and thinner items, the abundance of pockets is ideal. 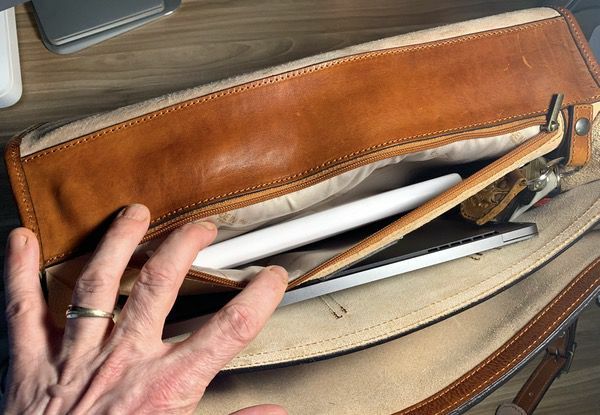 The assorted slip pockets and three different 7″ by 12″ zip pockets give you a bunch of versatility for organizing dongles, cables, small notebooks, travel documents, and the like while keeping the two main compartments clutter-free. At first, I thought that the three zip pockets were overkill, but I’m realizing that I don’t need to add the accessory pouches you usually need with these types of bags. 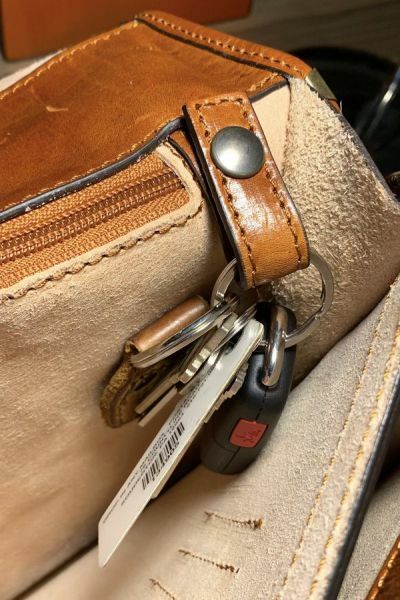 It makes for tidy and well-organized daily carry, and those pockets are slim enough that they don’t get in the way of storage if you don’t need them. I also like the rotating peg locks on the flaps. No clips to fumble with, or peg/loop arrangements that can come undone at the most inopportune times. Lock it, and it stays put. The flap design also provides a tight seal on the open compartments, which means stuff won’t spill out if the bag ends up on its side. You’ll appreciate that if you have to go through a TSA checkpoint. It makes for a very comfortable carry no matter how you haul it. 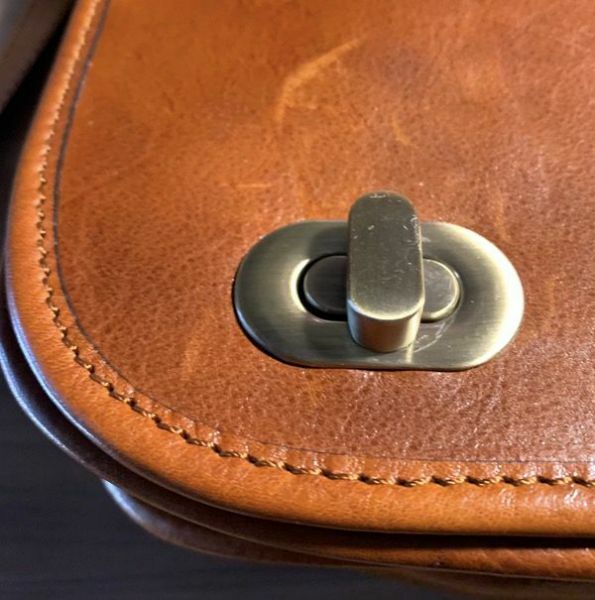 The handle features of soft pad under that leather with is really nice for handling. While I mentioned that I’d like a slightly beefier shoulder pad, it’s fine given the overall weight of the bag unless you are really overloaded. 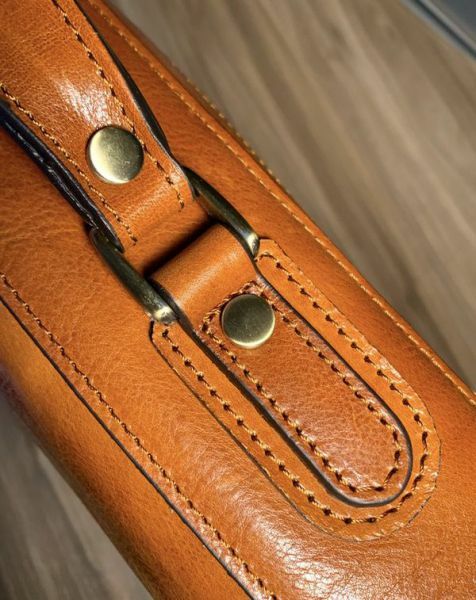 The Baltic Domini Men’s Orange Leather Briefcase is a beautiful, well-designed piece of Italian craftsmanship. 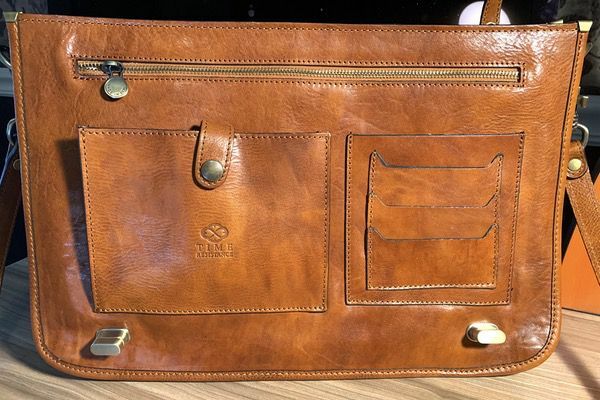 And I wouldn’t peg this as just a men’s bag; I think the style works well for any business person looking to upgrade their office style. In my opinion, it’s also a great value. 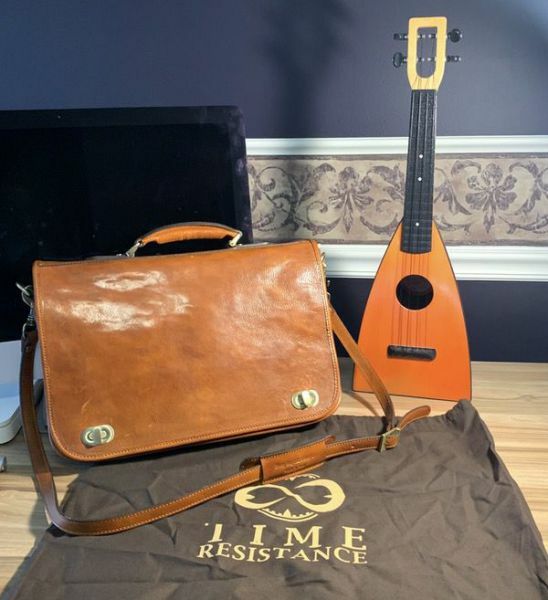 The bag normally retails for $225 which is great for a nice leather briefcase, but Baltic Domini currently has it on sale for under $200. If you’re doing some post-holiday shopping, this one is worth a look. Price: $225 retail, but on sale for $190 as of 12/27/18. Where to buy: You’ll find it at the Baltic Domini product page. I'm a digital marketer and an illustrator with a passion for user experience. I constantly dabble in gadgets and technology, with a particular interest in bags & EDC products, cooking, and creative tools. I'm also an old school punk rock guy and a rabid fan of sci-fi and fantasy genres... I have the Yoda tattoo to prove it.